I haven't watched animes for a very long time because I had my phase of KDRAMAS but my daughter Isabel have been bugging me about watching anime with her. Also, she and her Dad just finished watching Death Note so I guess its my turn this time. I told her to choose the title- we watched it via Gogoanime.com. She chose Le Portrait de Petite Cossette, a 3 episode series which at first she thought was a movie. The story begins in an antique shop being managed by Eiri Kurahashi, an artist and his female friend, Shoko Mataki. Eiri was checking the items in the shop when became attached to a goblet and that is when he began seeing a girl through the object that he is holding back. Shoko, a close friend of Eiri almost accidentally dropped the goblet which made Eiri mad as if possessed. Strange things begins to happen after that as Eiri becomes more obsessed with the girl behind the goblet. He becomes a different person also and falls in love with Cossette, the girl in the goblet. A murder incident also happened to the one who bought an armoire. This lead to the discovery of a painting of "Cossette" by the artist Marcello Orlando. At the onset of the series, I am reminded of the animation of Tim Burton specifically, "Corpse Bride." Le Portrait de Petite Cossette has a dark undertone and graphic torture and killings that I wouldn't recommend this to kids below 13. Also, it is best to have an adult watch it together with the minor so that things can be explained properly without the kid having nightmares. Hahaha, just kidding about the nightmare part. Anyways, what I love about this series is the plot that gives you a feeling that you know what the ending will be but will turn out to be different. Another parallelism that comes to mind is Orpheus and Eurydice. There's also the concept of earthbound souls and hell. 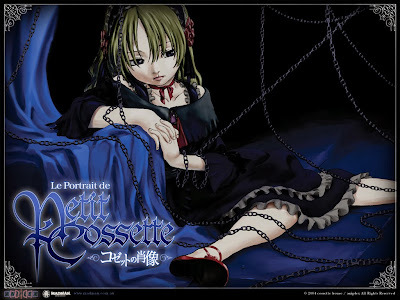 I was expecting it to be a bit predictable but knowing how good the Japanese are when it comes to making plots and a superb storyline especially for animes, then Le Portrait de Petite Cossette belongs to my list of must-watched animes. The battle between evil and good was presented well albeit in a psychological manner. The music was also good. Thumbs up!